VMware has just officially announced that their certifications will change the names with something different and no more related to the product version. New certification names will be identified by the year they are earned. Potentially this will make easier to immediately identify how current a certification is. This is an alignment with the vExpert badge or other certification badges, like for example the vSAN Specialist. 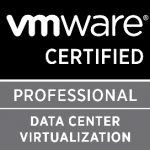 But the VMware Certified Professional – Digital Workspace 2018 (VCP-DW 2018) released in April 2018 was the first example of the new naming on the “real” certification. And starting in August 2018, all new certifications and select badges will follow the new naming structure. All current and past certifications are not affected, and there are no retroactive changes to certifications an individual currently holds. Additionally, CertManager will continue to reflect all VMware certifications held by an individual. Funny, but there isn’t a specific answer about certification expiration, so could that remain the same rules: VCP expire after 2 years if there isn’t a new certification activity. So, it’s a good choice? Maybe. But first is a better question is why of this change? Until now, VMware certification names have aligned to major product releases (for example, VCP6-DCV is mapped to vSphere 6), but there where some issues… for example sometimes the version will be related to the major and minor number (for example, VCP6.5-DCV is mapped to vSphere 6.5) and this makes a lot of confusion. And there are some cases, where more products are in the same “family” each with a different version, for example, NSX-T 2.x and NSX-V 6.x. This makes sense, but on the other side, make also some possible confusion with the new naming. Maybe it’s not so simple to have a single certification for each year. Let’s make an example: for two years we got VCP6-DCV and VCP65-DCV exams … similar but based on a different version of vSphere. Now will be not possible unless there are two different exams than give the same certification… too much conplicated. By looking at the new certification with this name, seems that there will be no confusion at all: exams maintain the product number. For example, for the VCP-DTM 2018 you need to pass the Professional Horizon 7.5 Exam (2V0-51.18)… so only one specific exam on one specific version. 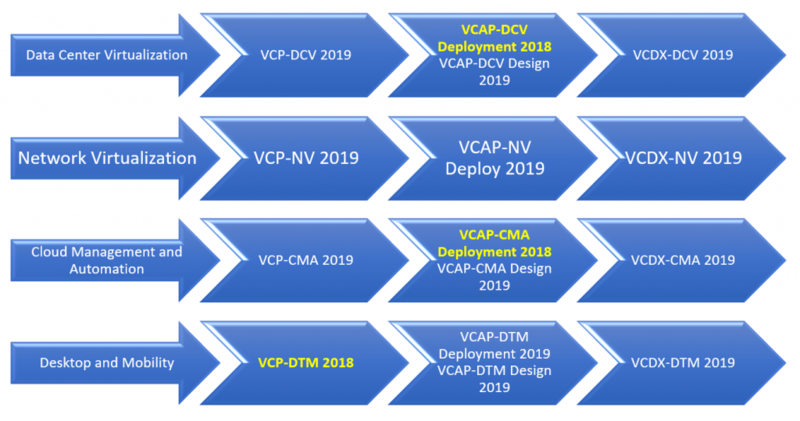 Let’s see how VMware will manage this transition, and probably the first good example will be the VCP-DCV 2019 that should be based on vSphere 2019… ops vSphere 6.7. During th,is phase there will be also the VCP65-DCV exam for some months… if not how requirements will be changed to manage this? Lot of questions, but time can give the proper answers. Anyway, this will be a huge change, but at least can bring back the beauty to have all certification with the same version, like was 3 years ago with version 6.